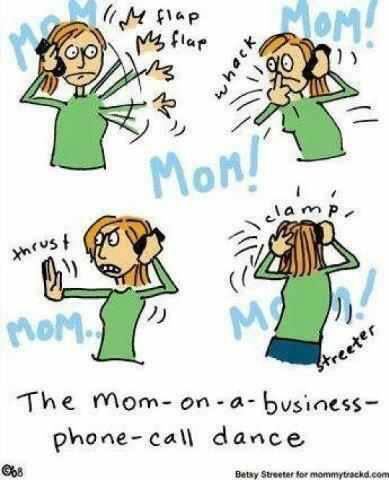 Parents, have you experienced this on the phone? I saw this pic on Facebook last night and it amused me sooooo much, I had to write about it. Let me explain what a telephone call in this mum in business’s home can be like.Now, if you have been reading the blog for any length of time, you will know that I reduced my professional hours as a pharmacist when I became a Mum. I wanted to stay home with the kids. I now have three of the most lovely girls aged 6, 4, and 2. As part of my relocation to more of a home-based life, I decided to keep myself busy and start a business in property. Something I can do around the girls, I thought. Great Idea and mostly it works out. However, there are times when you need to present a professional image and having squealing children in the background does not help. I accept that some perfect, heavenly kids recognise when it is time to shut down and be quiet but my girls are still on the way to this particularly great skill. In fact, they occasionally seem to wait until I require quietness and then, away they go! Does anyone relate to that? You can hear it as it approaches, your facade is about to be broken down, your eyes are darting around wondering how to make your escape, while maintaining the illusion of being in control. Getting louder as they approach you, there is crying, stamping, shouting as they lunge across the hallway and in come the kids, yelling your name. You know the person on the other side can hear them and you gesticulate like crazy trying to make your kids remember the warnings you have repeated OH SO Often and still they yell your name. You try to talk louder over them and pretend they are not there, hoping to drown out their voices. You know it is futile but you hold on to the last vestiges of professionalism. You run from the room to try and find a quieter place and close the door. The kids stand on the other side pounding on the door and yelling even louder. Which one do you choose?It is lovely to have the opportunity to be with my kids most of the time but there are times when things get just a little difficult to balance and one of those times is during the phone calls. I really enjoyed this post. I like what you advised “Two choices – call the person on the phone later and deal with the kids or run further away (Can you get outside?)”. Going further away is my best choice. Thanks for the great post, and I hope you have an awesome weekend! Clara Wells recently posted…How Can the Symptoms of Anxiety Just be a Problem of Thinking? I just found the picture pretty amusing as it really describes my life some of the time. Ha ha!! Rosemary N Knight recently posted…You think I am perfect, Well, I certainly am not!